In May 2008, the eastern departments pushed for greater autonomy, but Morales' government rejected the legitimacy of their position. They called for a referendum on recalling Morales, which saw an 83% turnout and in which Morales was ratified with 67.4% of the vote. 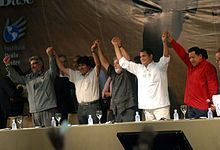 Unified as the National Council for Democracy (CONALDE), these groups – financed by the wealthy agro-industrialist, petroleum, and financial elite – embarked on a series of destabilisation campaigns to unseat Morales' government.Unrest then broke out across eastern Bolivia, as radicalized autonomist activists established blockades, occupied airports, clashing with pro-government demonstrations, police, and armed forces. Some formed paramilitaries, bombing state companies, indigenous NGOs, and human rights organisations, also launching armed racist attacks on indigenous communities, culminating in the Pando Massacre of MAS activists. The autonomists gained support from some high-ranking politicians; Santa Cruz Governor Rubén Costas lambasted Morales and his supporters with racist epithets, accusing the president of being an Aymara fundamentalist and a totalitarian dictator responsible for state terrorism. Amid the unrest, foreign commentators began speculating on the possibility of civil war. In February 2016, a referendum was held on the question of whether Morales should be allowed to run for a fourth term; he narrowly lost. His approval rating had been damaged by the allegations concerning his relationship with Gabriela Zapata Montaño. In December 2016 the MAS nominated Morales as their candidate for the 2019 presidential election regardless, stating that they would seek various avenues to ensure the legality of such a candidacy. 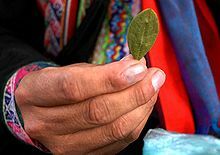 In December 2017, the Supreme Tribunal of Justice of Bolivia ruled that—in contrast to the constitution—all public offices would have no term limits, blaming American imperialism for the nullification of the referendum's decision, thus allowing Morales to run for a fourth term. Morales attended the swearing-in ceremony of Nicolás Maduro for his second term on 10 January 2019. In April 2019, Morales condemned the arrest of WikiLeaks founder Julian Assange, who exposed some controversies regarding America's military involvement in Iraq and Afghanistan. ^ "Venezuelan President Maduro sworn in for second term amid international boycott". The Telegraph. Retrieved 2 April 2019. ^ Laing, Aislinn; Ramos, Daniel. Adler, Leslie (ed.). "Bolivian President Morales has emergency surgery for tumor". Reuters.